Sports is filled with debates over the next big thing. It's a discussion that is often premature as lots of prospects, no matter the sport, just don't pan out. But there's another level of prospect where nobody denies they're all but guaranteed to be great. It's just a matter of how great. Before being drafted, Shaquille O'Neal, LeBron James and Andrew Luck all fit this super prospect category. Hockey's got a super prospect on the horizon and his name is Connor McDavid. Collectors still have some time to get in on Connor McDavid cards before his NHL debut, which is likely to come in 2015-16. Both In the Game and Upper Deck have produced cards so far of the phenom that are drawing plenty of attention on the secondary market. Shop for Connor McDavid cards on eBay. 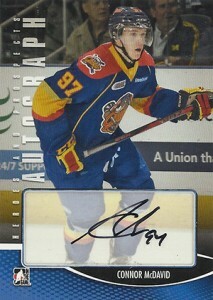 McDavid was taken first overall by the OHL's Erie Otters in 2012. Just 15 at the time, he was granted special Exceptional Player status so that he could join the league a year earlier than other players. McDavid didn't disappoint during his first season in Erie. He scored 25 goals and got 41 assists in 63 games, earning the league's Rookie of the Year Award. Shortly afterward, McDavid played for Team Canada at the 2013 IIHF World U18 Championships. Not only did he pace the tournament 14 points in just seven games, but McDavid was a key component in Canada's tournament win. They knocked off the four-time defending champion American squad in the finals. Hockey does a great job of making sure the sport's rookie cards are clear. While they are very similar to what's written for baseball, the other major sport that has a potentially long lag time from when a player is drafted until when the play, there's none of the complexity that comes with baseball's insert exceptions. Hockey has no Bowmans or other prospect inserts that really look and feel like base cards. There are NHL rookie cards and there are minor league cards. Because of this, few are going to argue that Connor McDavid's ITG and Upper Deck Team Canada cards are rookies. But that doesn't mean that they're second-rate or inferior in any way. 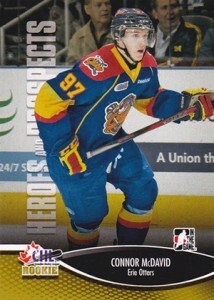 The first pack-inserted Connor McDavid cards can be found in 2012-13 In the Game Heroes and Prospects Hockey. Besides a base card and a couple of inserts, he has autographs and game-used memorabilia cards. The card maker also included him in ITG Ultimate Memorabilia 12th Edition and 2013 ITG Draft Prospects Hockey as well as several 2013-14 products. The first Upper Deck Connor McDavid cards arrived in 2014 Upper Deck Team Canada Juniors Hockey. Besides a couple of base cards, McDavid has autographs, an autographed patch card, several memorabilia cards and some inserts. These have become very popular, particularly the autographed patch card. Here's a break down of some of the best Connor McDavid cards that arrived before he started his NHL career. Check out his official NHL rookie cards in our detailed guide. Although a minor league issue, this has the distinction of being the center's first major base card. It might not be worth a lot, but it offers a great entry point for collectors without a big budget. 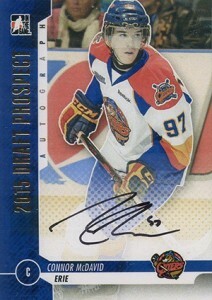 Besides having his first base card, 2012-13 ITG Heroes and Prospects also has the first Connor McDavid autograph cards. He has a basic autograph (a short print in the set) and an autographed jersey card. The autographed jersey card, although not serial numbered, is limited to 40 copies. There's also a patch parallel limited to 10 copies. All use stickers for the signature, but they're done in a way that it's tough to tell. Collectors can hunt for two different Connor McDavid autographs in 2013 ITG Draft Prospects. While they may not have been the first to market, they are the first with on-card signatures. 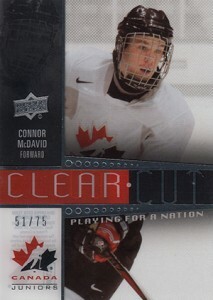 As far as early Connor McDavid cards, this is the most valuable, at least of those that are somewhat readily available. Featuring a sticker signature and a patch from a game-used Team Canada jersey, it's numbered to 125. On January 1, 2015, in the middle of the World Junior Championships, one sold on eBay for $799.99. Don't have the funds for the Auto Patch card? McDavid also has a pair of basic autographs in Upper Deck's Team Canada set as well. While they still fetch prices into the hundreds, they're not nearly as high as the one with the swatch. 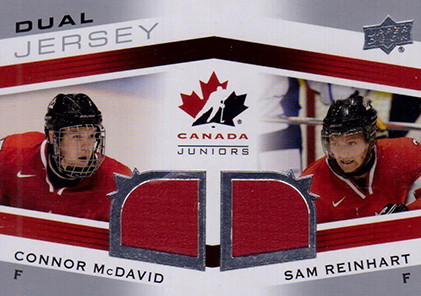 2014 Upper Deck Team Canada Juniors has several Connor McDavid jersey cards. This one isn't the fanciest of the lot, but it does offer something moderately priced that pairs him with another one of hockey's premier prospects. For those with tastes that lean more towards traditional inserts, this Clear Cut card might be the answer. Numbered to 75, it's done on clear acetate. The Clear Cut name also has a good amount of history with Upper Deck's NHL sets. Connor McDavid RC 2014-2015 ITG Top Prospects #21 Young Stars Rookie GEM10? fluffsta � There’s lots of great stuff not shown. We wanted to highlight some of what’s out there right now. Also some nice game used patch cards- ITG 2013-14 Drafts & Prospects 1, 2 and 3 colored jersey swatches limited to /5, /6, /30 etc.